Everyone should have a good, simple chicken recipe in their repertoire. The kind of dish you can make on a weeknight in a short time with a few ingredients you probably already have on hand. I've made other versions of a dish like this: chicken parts sautéed and served in a flavorful sauce of garlic and something acidic, which could be wine, vinegar or lemon juice. None of them are as good as this dish. Melissa Clark has perfected the simple chicken sauté. Honestly. This is another good example of her smart, simple cooking, which I have become a major fan of. The anchovies, apparent in the top photo, dissolve and are no longer noticeable in the bottom photo. The sauce is really amazing, a pungent mix of garlic, anchovies and capers with a pinch of red hot pepper flakes for some heat. Anchovy haters should know that the little fishies dissolve in the sauce as they cook. So not only do you not taste them, you don't see them either. Yet the briney meatiness they impart is absolutely essential to what makes this dish really sing. 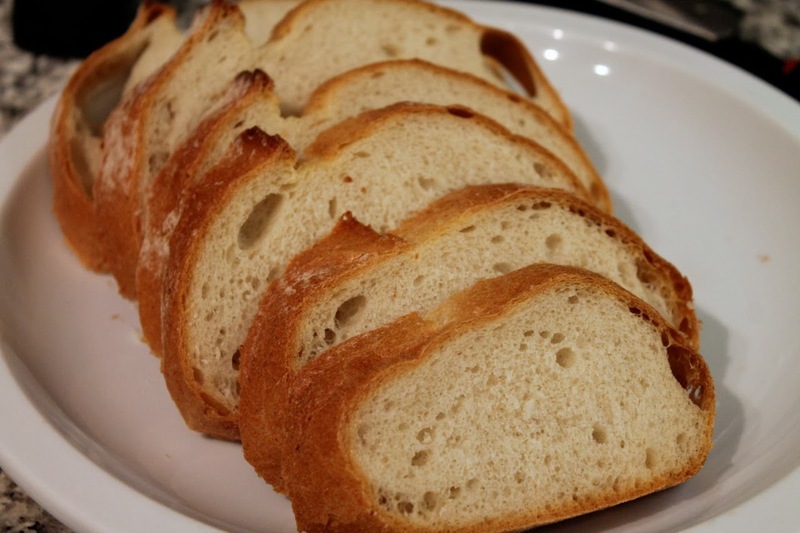 Some crusty bread is perfect for soaking up the sauce. Don't forget to wipe the pan clean with it. 2. 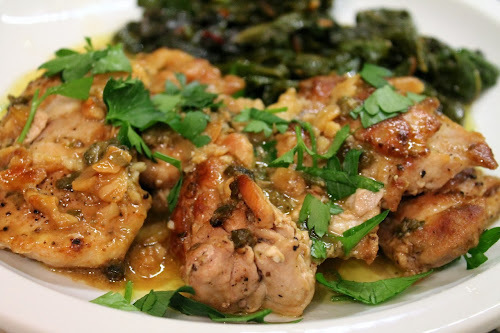 Set the chicken thighs on a plate and season with salt and pepper. 3. Mince one of the garlic cloves. Set it aside and smash the others. 4. Heat oven to 350 degrees. Season the chicken thighs with salt and pepper and let rest while you prepare the anchovy-garlic oil. Mince one of the garlic cloves and set it aside for later. In a large, ovenproof skillet over medium-high heat, add the oil. 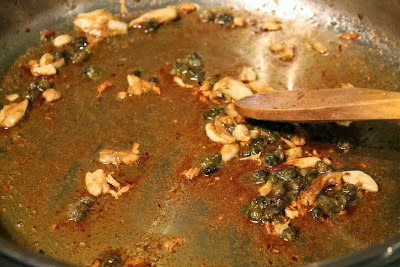 When the oil is hot, add the 5 smashed whole garlic cloves, the anchovies, capers and chile. 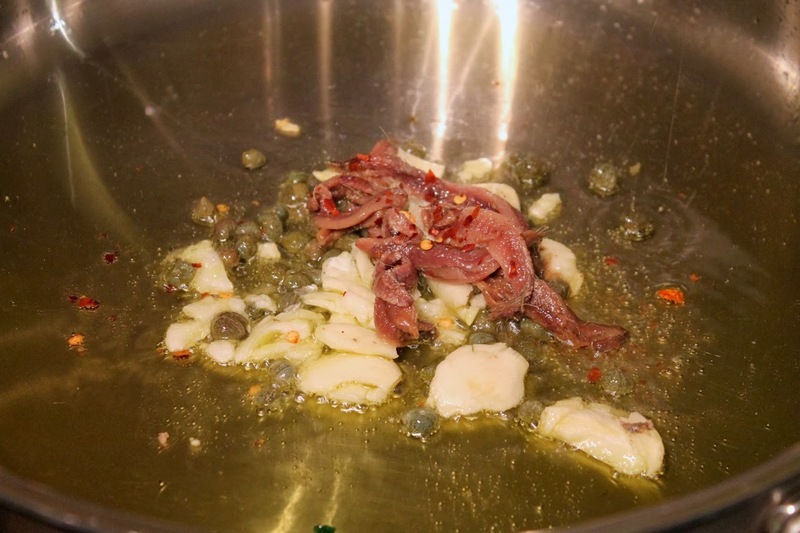 Let cook, stirring with a wooden spoon to break up the anchovies, until the garlic browns around the edges and the anchovies dissolve, 3 to 5 minutes. 5. 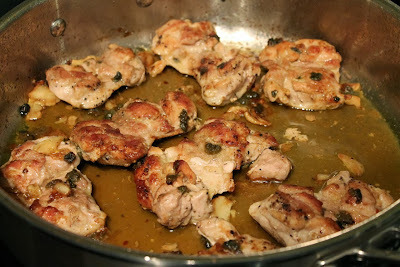 Add the chicken thighs and cook until nicely browned on one side, 5 to 7 minutes. Flip the thighs, place the pan in the oven and cook another 5 to 10 minutes, until the chicken is cooked through. 6. When chicken is done, transfer thighs to a plate. Place skillet back on the stove over medium heat be careful, as the pan handle will be hot), add minced garlic and the juice of one lemon half. Cook for about 30 seconds, scraping up the browned bits on the bottom of the pan. Return chicken to the pan and cook it in the sauce for another 30 seconds or so. 7. Transfer everything to a serving platter. Squeeze the remaining lemon half over the chicken and garnish with chopped parsley. Serve. The chicken was very good, but man, nothing topped soaking up that sauce with bread.